In 2018, change is the keyword for the Quebec election. After being in power for 13 of the last 15 years (and the last 4 years), the incumbent Liberal party (PLQ) suffers from low approval ratings . 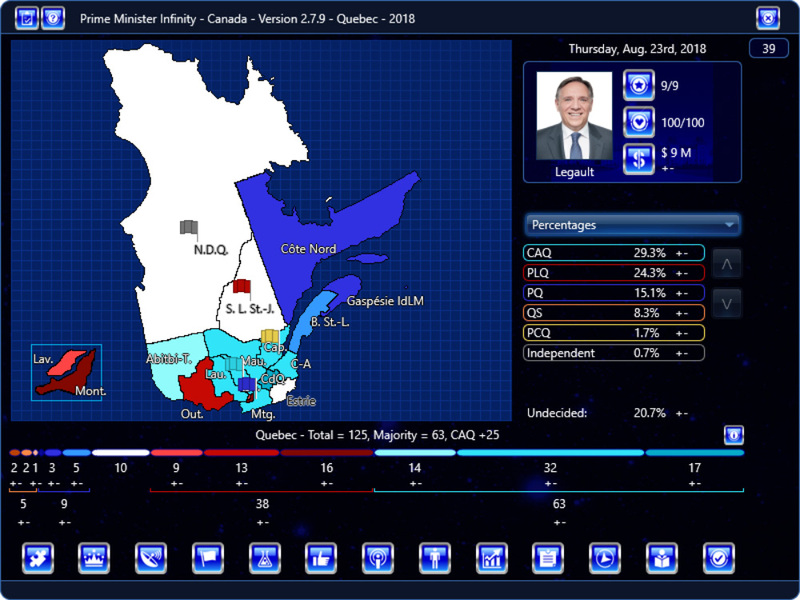 Since autumn 2017, the Coalition Avenir Québec (CAQ), with François Legault as leader, has been ahead of the PLQ in almost all the polls, with the Parti Québécois (PQ) – currently the official opposition – significantly behind them in third. Quebec Solidaire (QS), meanwhile, has merged with the independentist party Option Nationale, and is in fourth. It seems to be a two-way race between CAQ and PLQ, but with a lot of undecideds, the result is nowhere near certain. Will the CAQ be able to maintain its lead without alienating its base? Will the PLQ be able to win despite a historically low approval rate? Will the PQ be able to buck the trend and to keep its current seats, or even increase them? And finally, will QS be able to finally gain a seat outside Montreal? Premier Philippe Couillard under controversy : He tells a complete family can live with 75 canadian dollars by week. Free yourself. Join the team for change. 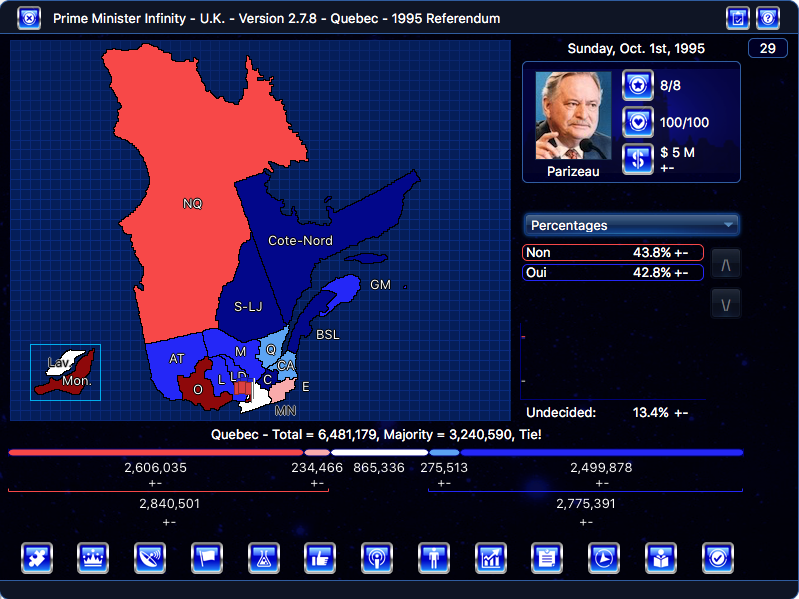 After the Parti Quebecois’ victory under Jacques Parizeau in the 1994 election and the triumph of Lucien Bouchard’s Bloc Quebecois in Quebec at the 1993 federal election, another referendum on Quebec independence was inevitable. The idea was initially unpopular and debate surrounding the referendum question and the style of the yes campaign lead to the referendum date being pushed back to autumn 1995. Parizeau has decided to go ahead with the referendum for October 30th and although the yes campaign is behind there is some expectation that Bouchard’s involvement in the campaign will give yes a boost. Will the no side hold on or will the yes side realise their long held dream? After 9 years of power the Liberal Party of Quebec faces one of the greatest political crisis Canada ever saw. The students of Quebec are fighting against the raise of tuitons fees of 1625$ to an unprecedent amount of 3946$ per year. The pro independence Parti Québécois which leads the Official Oppositon and which faced one of its most historic crush in opinion polls took the side of the students like Quebec Solidaire. The new Coalition Avenir Quebec -a nationalist party- which started high in polls and led by the former pequist minister François Legault is now third in opinion polls and the Liberal Party faces the lowest opinion polls never received due to the scandals of corruption and the student crisis. Can the PQ uses this crisis and at its benefit? Can the CAQ moves back first in opinion polls? Can the LPQ return the crisis at its benefit? 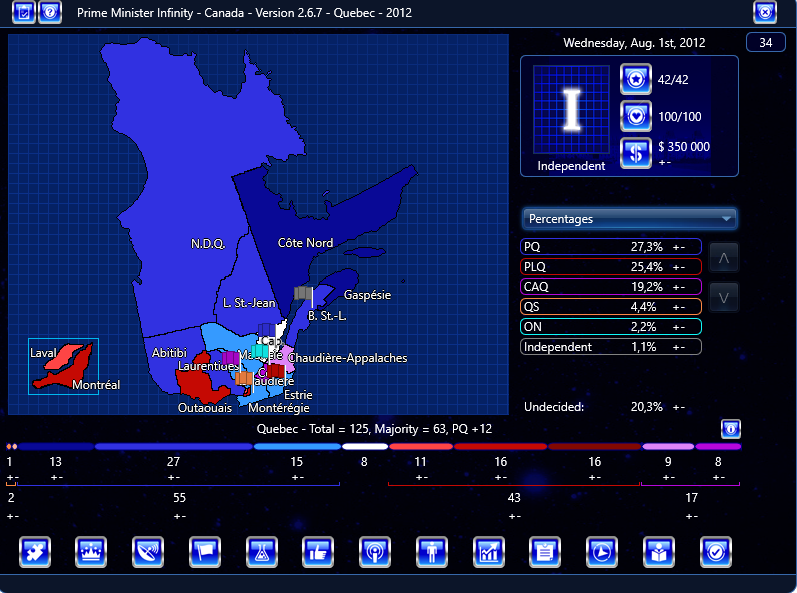 Even more, the independentists of Quebec are now divided. The new Option Nationale -extremely independendist- and led by the former Pequist MP Jean Martin Aussant is winning supports among youngs, and Quebec Solidaire -also independentist- is increasing its supports. Despite the strategic vote, can they take votes to the Left, and essentially, the Parti Quebecois? 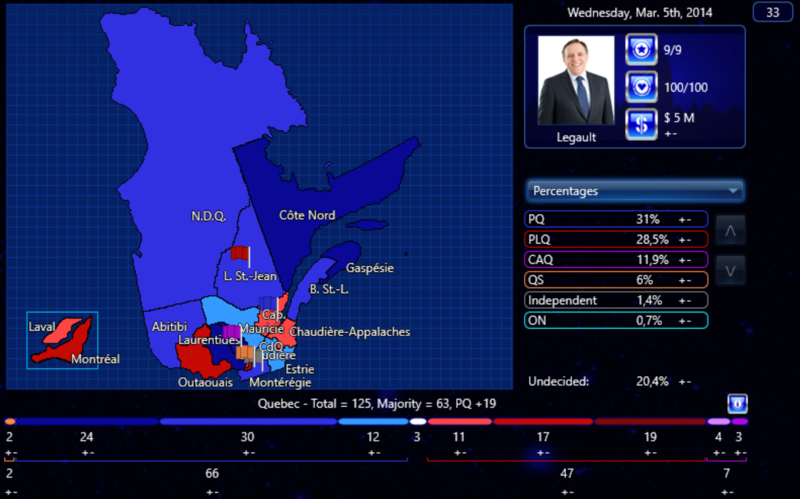 Can the Parti Quebecois stops their expansion? The divided race is now open! -Jean Charest: Pauline Marois wants a referendum on sovereignty! “Do you agree that Quebec should become sovereign after having made a formal offer to Canada for a new economic and political partnership within the scope of the bill respecting the future of Quebec and of the agreement signed on June 12, 1995?” 15 years after the first sovereignty referendum failed the sovereigntists have tried again and so far haven’t done very well but now Lucien Bouchard takes over their campaign. In 2014 the Parti Québécois, an independentist party in the center left which is in power since two years is looking for a majority to have the means to…maybe, call a referendum in the next years. The debate of the Charta concerning the religious values has given a strong support to the party which lead in polls. Can the PQ wins or will someone else would create the surprise? Please let us comments and ideas, I am hesitating to work on another electoral fights.